The boy and his friend are building a wonderful tower of blocks. Carefully Jack's boy gets ready to place the last piece on top of the tower when Jack comes running in and sends the whole fragile creation tumbling. The boys are not pleased and send Jack to the other room. They are even less pleased when Jack knocks the tower over for the second time. Finally the boys are able to complete their tower and yet something is missing, the last piece for the tower is not there. Surely it must be Jack's fault and the boys search Jack's bed and all over the place. 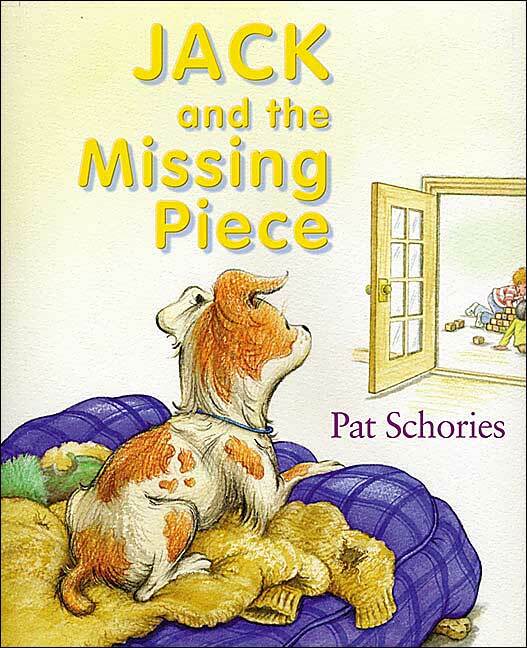 It is in fact Jack himself who finds the missing piece and who shows the boys that he was not the one who stole the precious last piece. In this wordless book the author skilfully portrays the joy of a dog wanting to play with his boy and the consequences of his joy. Little children who cannot yet decipher words will love having a book that they can "read" for themselves and which still contains all the elements that make a book successful.